WHAT HAS HISTORY SHOWN US ABOUT INVESTING? In view of the recent market ups and downs, if you’re an investor, you might be thinking about pulling out of higher risk investments, such as shares, and transferring them to lower risk investments, like cash or term deposits. But if you’ve just started your investment journey, you might not be aware of how investments perform over time. So here are some things to think about before making any changes to your investments. Share markets go up and down and this affects investor sentiment and the performance of listed companies which trade on the official stock exchange. 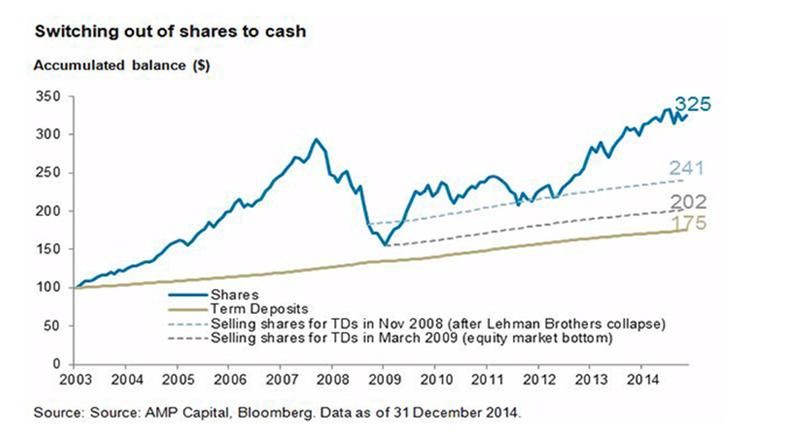 The Global Financial Crisis (2008) had a major impact on the Australian share market but the market recovered. 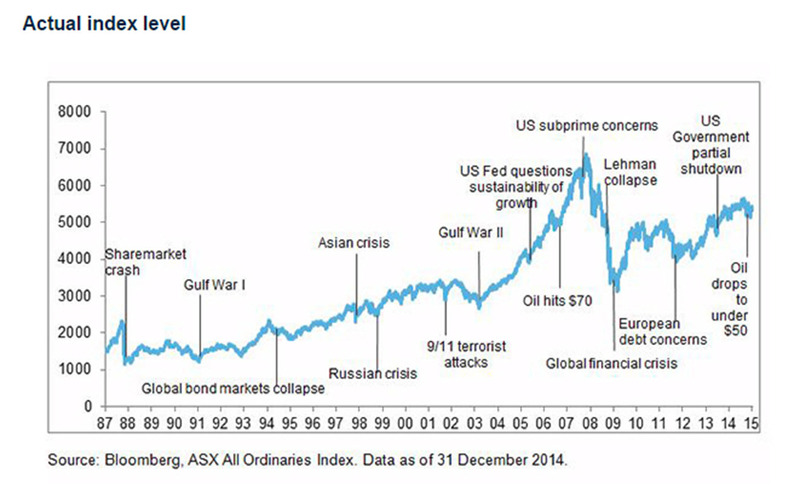 So it’s important to remember that markets always rebound from major events and move on to new highs, as the graph below shows. History tells us that investing in shares almost always provides a higher return than investing in low risk investments, such as cash or term deposits. For example, if you’d had shares and switched out of them into cash during the Global Financial Crisis (GFC) in 2008, you’d still be recovering from their drop in value. But if you were an investor who ‘rode the storm’ and kept your money in shares, you’d be better off now, as you can see from the graph below. There’s no crystal ball to tell us when the markets are going to change and how they’re going to perform over time. That’s why, generally speaking, it’s best to have a variety of investments across different asset classes. And remember to take a long-term view when it comes to investing. If you’d like to learn more, call us on (03) 9851 0300 so we can help you on your investing journey. https://www.tdls.com.au/wp-content/uploads/2016/09/news3b77d3f73b59742412f393cd0d264b14_XL.jpg 600 900 The Webmaster https://www.tdls.com.au/wp-content/uploads/2016/10/tls-logo-1.png The Webmaster2015-09-30 08:27:362018-05-05 22:36:33WHAT HAS HISTORY SHOWN US ABOUT INVESTING? Due to an obsession with Taylor Swift and then The Carpenters I decided I needed to have a Carpenters’ CD with the full Burt Bacharach medley they performed in the early 1970s. So I went to Amazon and found that it was only on a Japanese Carpenters’ Anthology CD which would set me back $US150 from the US or $65 for a “very good” second hand edition from Japan. The last time I got a “very good” second hand Elvis book from Amazon it had some pages missing but I decided to give the Japanese CD a go. ATM Tampering has become an increased method of Fraud. Here are some information and tips to follow when using ATMs. What is ATM Card Skimming? ATM card skimming is a method used by criminals to capture data from the magnetic stripe on the back of an ATM card. The data is then transmitted wirelessly to criminals waiting nearby. The devices are attached over the top of an ATM’s card reader slot. PIN capturing is attaching a camera in a certain position on the ATM in order to capture the user’s PIN. ATM card skimming can also be done at EFTPOS terminals in shops. Staff can swipe your card through a fake terminal before the real one to capture your details. Inspect the front of the ATM for unusual or non-standard appearances around the card slot reader such as scratches, marks, adhesive and tape residue that could indicate that the ATM has been tampered with. When shopping and paying via EFTPOS, keep an eye on your card at all times. ATM skimming devices can often be very hard to detect. The below example shows a machine with and without a skimming device attached. Common things to spot are a non-flashing light on the card slot and sticky residue around the card slot. If you do not feel safe using an ATM or think that it has been tampered with, do not use it. Be aware of your surroundings when using an ATM. Does not use or approach an ATM if there are people nearby that make you feel threatened. Be suspicious of an ATM if it has a physical sign on it advising you to use another ATM. Do not approach any suspicious people hanging around the ATM under any circumstances. Do not allow anyone to observe you entering your PIN into an ATM. You should cover the keypad with your hands whilst you enter your PIN, even if you believe you are not being watched. If an ATM does not return your card or does not issue your money stay near the ATM and contact your bank immediately. Uncertainties regarding the emerging world and specifically China and the US Federal Reserve’s much talked about first interest rate hike have continued to result in volatile share markets over the last few weeks even though most have not made new lows for this downturn. Whenever there are sharp falls in share markets like recently, there is a temptation to wonder whether we are seeing a re-run of the last major crisis. Fortunately, the conditions today are very different to the run-up to the global financial crisis (GFC) which originated in the developed world, notably the US. The developed world hasn’t seen the sort of excesses that preceded the GFC: there has been no generalised bubble in investment spending (housing or otherwise), there has been no asset bubble, there has been no easing in lending standards like that which occurred with sub-prime debt and there has been no build up in inflation pressures or monetary tightening. So it’s hard to see the sort of unravelling in global financial markets that started in interbank lending and credit markets, threatening a seizing up of the global financial system and spreading through all growth assets that we saw through the GFC. https://www.tdls.com.au/wp-content/uploads/2016/09/oliver.jpg 504 900 The Webmaster https://www.tdls.com.au/wp-content/uploads/2016/10/tls-logo-1.png The Webmaster2015-09-11 02:01:012016-09-22 07:13:56HOW SERIOUS IS THE THREAT FROM THE EMERGING WORLD? The Australian economy remains in a difficult period as the mining boom unwinds. Non-mining activity has bounced back but is far from strong enough to offset the headwinds coming from the mining downturn. This note looks at the outlook for growth, interest rates, profits and what it means for investors.